India registered their maiden bilateral ODI series win in South Africa with an emphatic, 73-run win over the hosts at Port Elizabeth. They took an unassailable 4-1 in the 6-match series, and now the last ODI at Centurion is only of academic interest. India fought hard and had their moments in the Test series but were on the receiving end of the 2-1 score line. However, they managed to turn the tables in the ODI series, which bodes well for the future and the 2019 World Cup. Here are 7 reasons why India managed to put up a better performance in the ODI series. India have always had an iffy record in Tests outside the sub-continent. Prior to 2000, when Sourav Ganguly took over the captaincy, they used to struggle to win Tests away from home. Since then, they have improved their away record in Tests. On the other hand, there is no doubting their pedigree as a top team in ODIs. Since their 4-1 loss to Australia away from home in January 2016, they have won 9 consecutive bilateral ODI series. They even reached the final of the Champions Trophy in 2017, where they lost to Pakistan. India are a fine ODI side and have the versatility and personnel to win even away from home in unfamiliar conditions. After India’s loss in the Test series, much was written about the lack of practice games to acclimatize to the conditions in South Africa, which have more bounce and lateral movement then those in India. Inexplicably, India went into the Tests without a single warm-up game and were found wanting. By the time the ODI series commenced, they had gotten used to the pace and bounce, and batted with much more assurance. In the ODIs, they countered the Proteas pace bowlers with aplomb. The wickets in most countries have a certain character which tends to favour the home team due to years of playing on it. Even though India have a good all-round attack and top-quality batsmen, they were helped by the fact that the pitches for most of the ODIs were slow and low, offering plenty of turn to the spinners. The commentators even joked about how the hosts went out of their way to make the Indians feel welcome by preparing tracks which were almost Indian like in character. These favored India in 2 ways: it helped their spinners, who were delighted to find some turn, and it masked the technical inadequacies of some of the Indian batsmen who could just hit through the line. All good teams should have depth and not just rely on a few individuals to get the job done. But sometimes, it doesn’t matter how much depth a team has. When you lose your captain and also one of the best ODI batsmen in history, you are bound to struggle. There was no denying the fact that South Africa wasn’t at full strength due to injuries to AB De Villiers (who was unavailable for the first 3 ODIs) and Faf Du Plessis (who injured his finger after the first ODI). To make matters worse, Quinton De Kock, their first-choice wicket-keeper was off color and also got injured. De Kock is one of the best ODI batsmen in world cricket. Losing their top 3 batsmen hurt South Africa immeasurably. This put enormous pressure on Hashim Amla, who was unable to deliver, scoring just 144 runs at 28.8 with a solitary fifty. In the Test series, the wickets were such that the spinners were almost taken out of the equation. In the ODIs, India had 2 wrist-spinners in their arsenal who are amongst the best in the world. They were always willing to flight the ball in their quest for wickets. They were not worried about getting hit. They used all the variations in their repertoire of tricks. Most South African batsmen failed to pick them from the hand and tried to play them off the pitch, which was a recipe for disaster. Kuldeep Yadav took 16 wickets in 5 matches at a bowling average of 11.56 and an economy rate of 4.51 while Yuzvendra Chahal took 14 wickets in 5 matches at a bowling average of 16 and an economy rate of 5.31. Apart from the 4th ODI at Johannesburg, where the wet outfield meant that the Indian spinners were unable to grip the ball properly, they spun a web round the Proteas batsmen who looked clueless against the turning ball. India’s ODI bowling attack is extremely versatile and seems to cover all bases. Much has already been said about the wrist spinners but in Bhuvneshwar Kumar and Jasprit Bumrah they have 2 pace bowlers who are excellent at the death, where they bowl yorkers almost at will, and they can also get movement and early wickets with the new ball. In 5 matches, South Africa managed just one fifty run partnership and always lost a wicket in the first 10 overs, which made the job of the Indian spinners easier. Lastly, Kedar Jadhav, who bowls off-spin that hardly bounces, can be relied upon to bowl a few economical overs if one of the front-line bowlers has an off day. This is an attack which covers all bases and which can do the job in all conditions. India’s batting is top heavy. There are some justifiable concerns about their over-reliance on the top 3 to register big totals, with the middle order failing to come to the party. 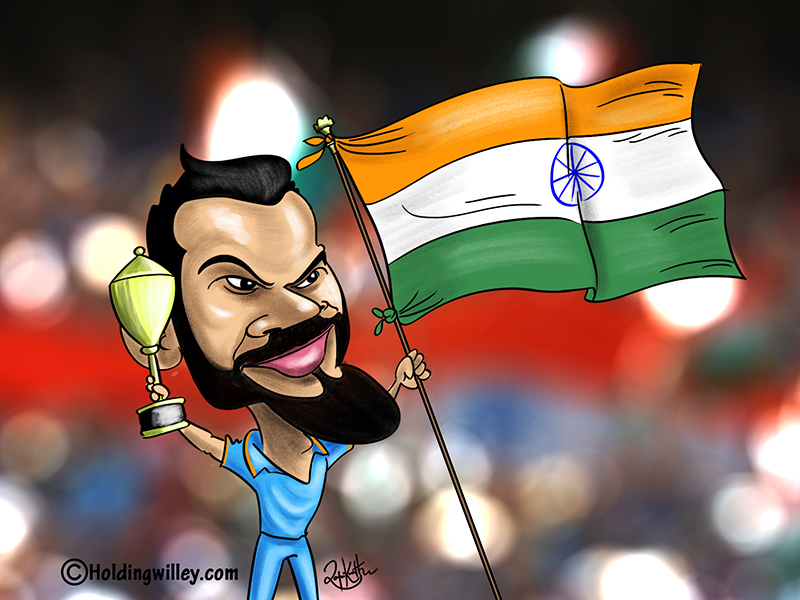 Having said that, Virat Kohli and Shikhar Dhawan were in scintillating form in the series and Rohit Sharma roared back into form in the 5th ODI with a century. South Africa’s top 3 batsmen averaged a combined 31.6 while India’s top 3 averaged a combined 74.08 with the bat. India’s top 3 averaged 134.43% more than their South African counterparts and this masked the relative weakness of India’s middle and lower order. This was one of the main reasons for India’s supremacy in the ODI series.